Formulating an impressive resume which stands out of the rest can be a challenging task especially when there are limited verbs to be used. Luckily there are abundant powerful verbs which are used in order to make your resume look awesome. Apart from the usual wordings which the hiring managers have heard all the time, getting a little more creative with powerful verbs can make your resume look special. Make use of a few common words along with phrases which are strong which will catch the eyes of hiring managers. 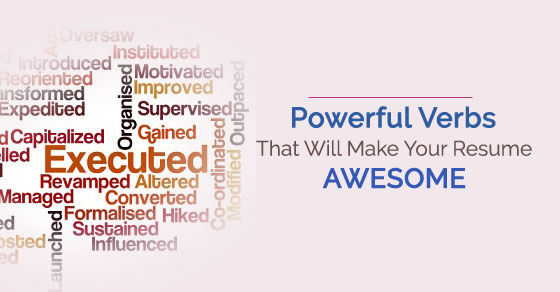 Let’s glimpse through a few powerful verbs that will make your resume awesome. As an employee, if you have to lead a project or a team and have been the responsible person from the start till the end of the project, then almost every one of you would use the word “lead” the project. When these powerful verbs are used in the appropriate place, then they make the resume look awesome. There are many employees who need to write something they developed for their company. When they have formulated new aspects for the company, they mention with the usual word “Printed” in the resume. In order to present your talent in the company, employees use verbs where they used to be cost-effective and efficient. Hiring managers look out for exceptional resumes which show their cost-effective and efficient manner in their team. Every employee in their resume would try to bring in terms in English to mention that they have increased sales, customer satisfaction, efficiency, revenue, and more. Every resume would surely have some aspect that uses the word “changed” or “improved”. You must have made few amazing aspects in your department which need to be mentioned in the resume. You may have changed or improved the invoicing system or something else related to technology into the latest updated one. Many times all the resumes are found with the usual verbs when employees mention that they have “managed” a team. Instead of using the same old stuff where resumes have a sentence such as “managed a team” and more. In order to bring value to your resume by making use of exceptional verbs, you need to replace certain verbs. Would you like to include, writing, communicating, lobbying, speaking and related aspects of your resume? Then make use of powerful synonyms or verbs that make your resume stand out of the best. These are a few powerful verbs which can be utilized in the resume in order to make it look awesome. Resume is the initial ticket which is also a decision maker where it takes the candidate to the next level in the hiring process. Formulating a resume should be made in an exceptional way so that the hiring manager is inspired by your resume and the unique words used in the same. Only a powerful and standard resume which looks unique can fetch you an opportunity to reach the next level. Every session either communication, finance, helping skills, or teaching has its own appropriate words to be used. Candidates can make use of these excellent words rather than following the same old fashion of writing resume. When these high standard words are put together they offer a quality look and make your resume awesome. Hence the above mentioned resume verbs can be made use in the appropriate places so that it looks rich and get qualified. Next articleHow to Deal With a Long Job Interview or Hiring Process?